Save Fuel and Engine Wear - A typical diesel uses a gallon of fuel an hour when idling. With an ElectroWarmth® Bunk Warmer in place, there is no need to idle engine all night to keep warm. Also saves engine wear caused by prolonged idling. Pays for itself in fuel savings alone in less than a week. 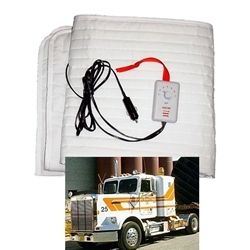 Most drivers consider the Bunk Warmer one of the best investments they have ever made. It is well worth the cost for the sleeping comfort, but it keeps saving you money night after night, year after year. Saves on motel bills also. This is not a fitted mattress pad. It is a flat heated pad that lays on top of the mattress. Made from two sheets of fine weave, pre-shrunk poly/cotton cloth quilted together, similar to a high quality mattress pad. The closely quilted seams form tunnels, and hold the heating element wire inside for uniform heat distribution. Padded with bonded polyester fill. Twin - 36" x 60"